CLICK HERE to see Part I of Terry Chapman’s visit to The Woodwright’s School. And then on the second day, we all came back and started again. 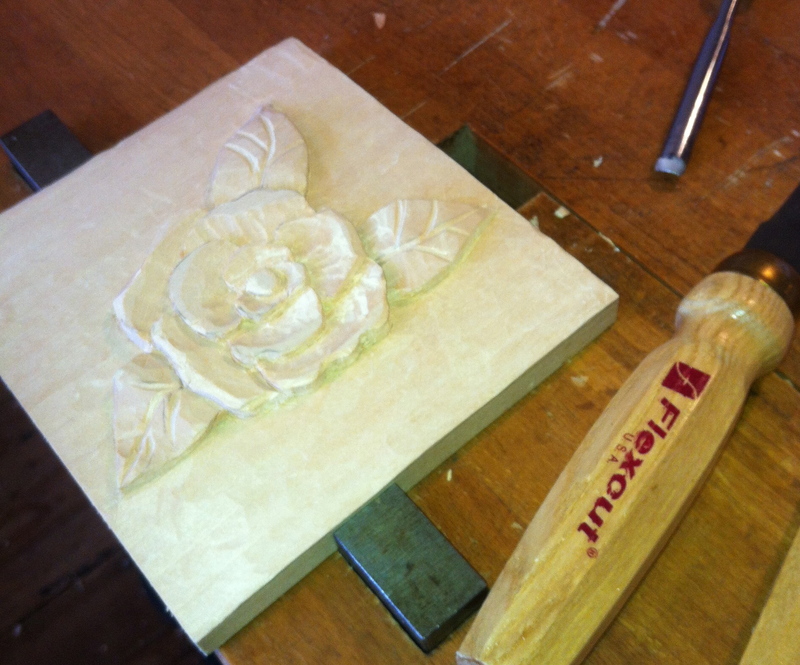 We were still working on the camellia blossom in low relief and trying to make that look as good as we could. What I found out was that I like real life style carving. I want stuff to look like stuff. What Mary kept telling me was that it is a “representation” of real life. When you carve stuff as a representation of stuff, then there are tricks to fool the eye to make stuff look more like stuff. Read that sentence again, Rufus. I mean a real camellia blossom is what — inch and a half tall? Our carving is sitting up maybe an eighth of an inch above the background, so you have to use tricks to make it look good. (She was making fun of engineers who are very literal, that is until she found out I am one. Explains a lot of things.) The example she gave is Washington’s head on a quarter. Look at the outer edge and you will see the edge is rounded rather sharply, and it is that rounding which gives the appearance of much more depth than is actually there when you look cross-wise across the face of the coin. We traced a pattern on the mahogany and went at it. Mary makes it look so easy. She takes that little vee gouge and just makes about two sweeps and cuts the smoothest little curve just the right depth. She has callouses on the outside edge of her palms just below her wrists where she pivots her hand to make a smooth curve with the tools. I watched her do that and thought, boy, that is so simple, anybody can do that. Ha!! Anybody can’t do that! First of all, her hands and wrists are so strong, she makes it look absolutely effortless. Second, her tools are so sharp, that even the mahogany cuts like buttah. I noticed early in this class she is much more careful around her chisels than I feel is necessary around my chisels. Hers are sharp! 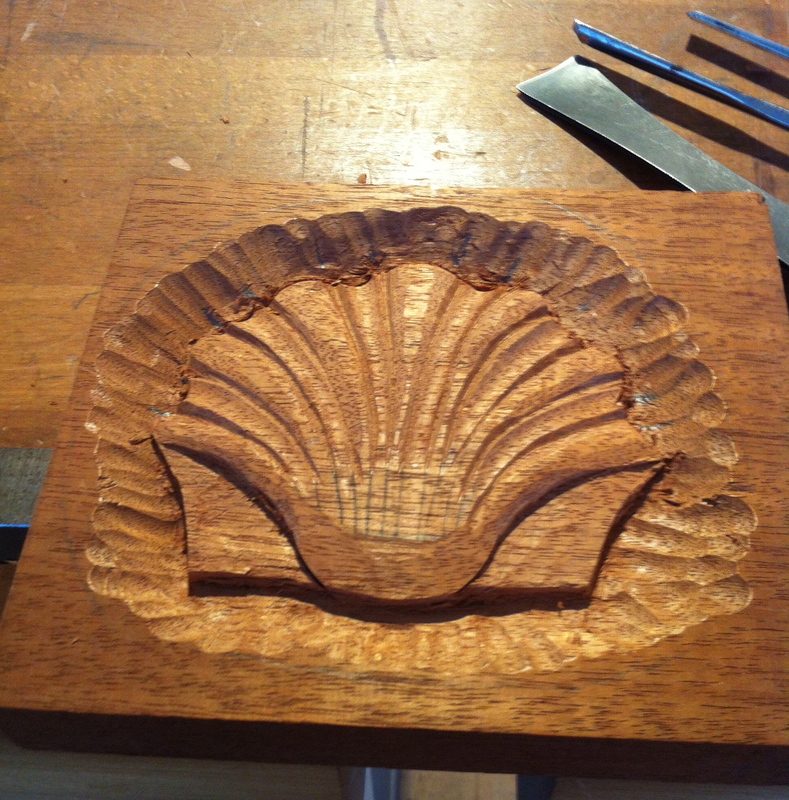 We started digging out around that shell and then we needed to carve little valleys on all the little lines to make the shell. My gouges are too big for the task, so I had to borrow a couple and then make do with the rest. It is very easy to make the whole thing “muddy”. I could put a picture of her shell right next to mine, but I will not do that — man’s got to have a little self-respect, you know. But if you could compare the two, you would instantly see that my edges are not well defined, my grooves are not symmetrical, my ridges are lopsided and my mollusk drank too many sugary soft drinks as a teenager. On the other hand, if you don’t see them side by side, than a man riding by on a fast horse at dusk would say mine is not too bad. Here’s what I learned: Roy Underhill is a very smart and well-educated man and a marvelous woodworker. He walks just like he does on TV. Mary May is top of the line and very talented. She could strangle you with her bare hands. Her classes are excellent. I can recommend her classes and The Woodwright’s School. Watch for Mary’s class at the High later this year. You will like woodcarving. I just checked over on Mary’s web site and she has a blog entry about the class and Roy Underhill. She has a picture of Roy sharpening my vee gouge and a picture of the entire class and the classroom. See the blog at http://www.marymaycarving.com/blog/2013/02/17/filming-another-show-with-roy-underhill/. Her web site is http://www.marymaycarving.com. Look on the home page and see the dolphins she carved out of stone. They are taller than she is. Beautiful! !